. 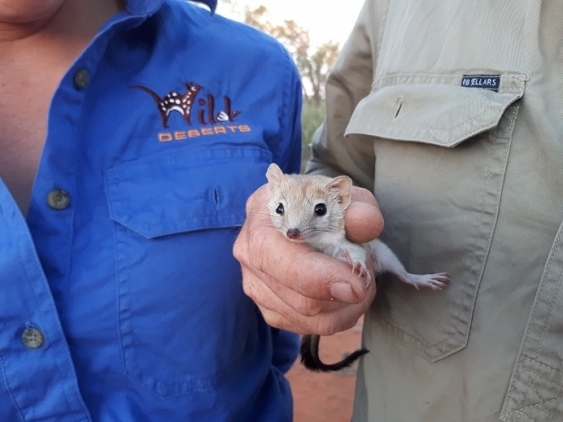 . . A team from the UNSW Sydney’s Wild Deserts project made the unexpected discovery during recent scientific monitoring. 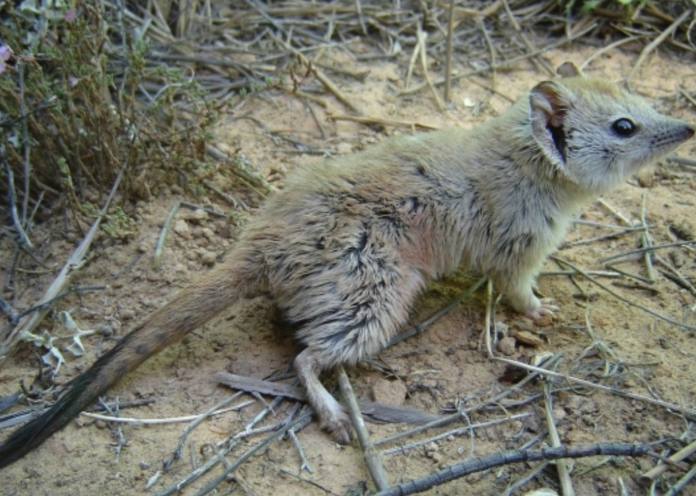 “The Crest-tailed Mulgara was once widely distributed across sandy desert environments in inland Australia, but declined due to the effects of rabbits, cats and foxes,” West says. The discovery comes at a great time, according to UNSW scientist and Wild Deserts project co-ordinator Reece Pedler. “Next year we are due to begin introduced predator and rabbit eradication from a large area, which will no doubt help the Mulgara,” Pedler says. Now what confuses me here is that there’s a Wikipedia page on the species, not mentioning its rediscovery, giving a range map, implying that there are a fair number of these things, and showing the picture below. They do say that there are two species in the genus, the other being the brush-tailed mulgara, but this one is clearly identified as the “crest-tailed mulgara”. Nor is the brush-tailed mulgara described as having nearly gone extinct. Photo credit: Bobby Tamayo, Simpson Desert, QLD. Perhaps Wikipedia has gone badly wrong here, in which case we have another examples for Greg Mayer’s long-promised “What’s the matter with Wikipedia?” post. Readers are welcome to clarify this conundrum. This entry was written by whyevolutionistrue and posted on February 10, 2019 at 12:45 pm and filed under conservation, mammals. Bookmark the permalink. Follow any comments here with the RSS feed for this post. Both comments and trackbacks are currently closed. The page does mention that “The mulgara was presumed extirpated in New South Wales for more than a century, but was re-discovered in 2017 in Sturt National Park north-west of Tibooburra. It seems to me that Wikipedia is doing okay on this one. They certainly never ceased to exist. They just persisted in a patch of favorable habitat and were discovered there. What a find and it’s so endearing too. What wonderful news! New hope for this cute animal and other marsupials. Does anyone know whether the project includes aboriginal Australians? Yahoo! But truth be told, I never knew they were endangered, let alone considered extinct. It seams the animal was thought locally extinct in the area in which it has now been found. There is also a small population in Queensland. Hmm. Article has a lot of problems. 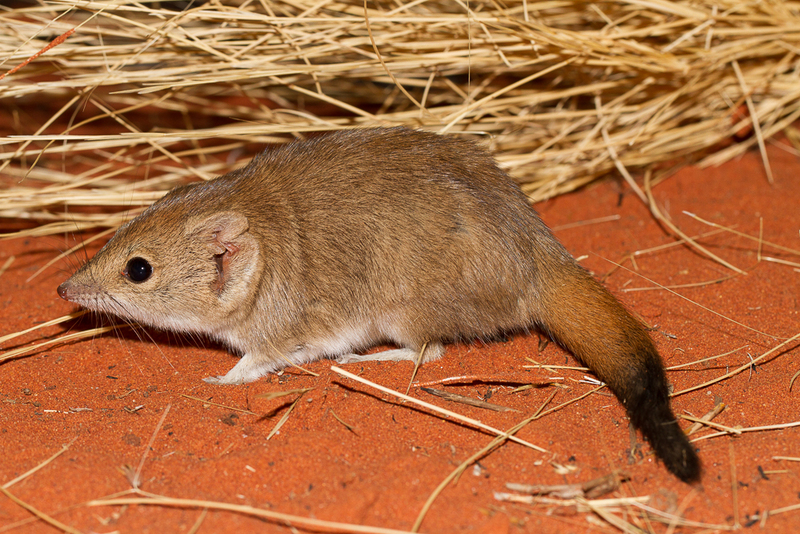 The Mulgara was never extinct at all, but just (thought to be) locally extirpated. Such good news is sustaining in these times of trouble. I’ve been toying around with an idea I call a virtual extinction (I made the name up while reading “The Universe in a Nutshell”). Basically, at a certain point, the species is more or less doomed to die. We can keep it around for a while, but it’s really only a stop-gap measure; even if the species were to survive, the genetic bottleneck would be horrendous and the likelyhood if it surviving for long without being domesticated/adopted as a pet is nil. A tortoise species with only one surviving male member, for example, can be treated as extinct for all practical purposes. Even a breeding pair is unlikely to succeed. A related concept is….I don’t have a name for it. Ecological extinction? Anyway, the idea is that the species becomes so rare that it basically ceases to have any ecological significance. Quite obviously if all members of a species are in captivity this applies. I’ve wondered if the California Condor fits this–there are so few of them that they can’t be said to play a significant role in the ecosystem. That said, this is a really hard line to draw. Most species are rare in a community, after all, and “rare” and “impact” do not necessarily correlate. It doesn’t take many Tyrannosaurus rex specimens to significantly alter a community! Anyway, whenever I hear of a species being re-discovered I wonder about how it fits these two concepts. I mean, yes, I”m excited that the species is still around–but I also wonder, essentially, if the discovery is going to amount to little more than a brief curiosity. I have long said that nothing makes you as cynical as working in the environmental industry. Species that are reduced to a very few can still recover with protection. A number of examples of that exist. Organisms produce excess offspring and populations can grow substantially if conditions permit, even starting from a low base line. Sea otters, elephant seals, fur seals, are examples. As long as a few exist, there’s hope. This re-emergence of the crest-tailed mulgara makes me so happy! We always hope, but generally in vain. Next the thylacine! We’re still hoping.